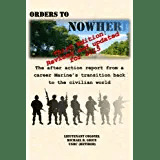 Written over the two years of navigating the often frustrating and always confusing waters of military transition, Orders to Nowhere is finally available in print, with the updated and revised Third Edition available today! I wonder if you’d have some time to discuss veterans educational issues with me. After retiring from the Air Force transitioned to a great job at the postsecondary level, assisting veterans and currently serving military members connect with school. I’d love to pick your brain regarding the education piece tied to the transition. Do you have some time to chat? I would very much like to chat- email me at mike@orderstonowhere.com and let’s see if we can link up.